DescriptionBabyzen YOYO stroller : very light, very compact, it can be rented for your next trip with baby or to stroll Paris (you may even be able to use the metro with it). • Small like no other when folded (52 x 44 x 18 cm). Fits in the smallest spaces and in the overhead compartment of an airplane*. * Usual authorized size for cabin baggage: 56 x 45 x 25 cm. Dimensions may vary depending on airline. Color: grey or black depending of availability. 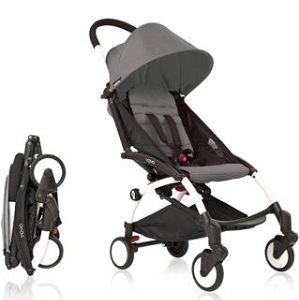 See the Babyzen Yoyo stroller video. Whether you're staying for few days in Paris and would need a compact, light stroller that allows you to take the metro with baby or fold it easily while in a restaurant or would need a compact, light stroller for holidays with baby, the Babyzen YOYO stroller will fit your needs. Rather than purchasing a specific second stroller for a few days use, rent this lightweight pushchair in Paris. The Babyzen Yoyo stroller folds and unfolds with one hand only - makes it easy to take Paris public transportation with baby- and folds in a very compact way -very convenient to put it in a taxi trunk or under the table in a restaurant. Its shoulder strap allows you to carry it like a bag. Comfort is not neglicted with its wheel suspension innovative system, padded seat and reclining backrest. What a lifesaver! baby'tens had all the equipment we needed allowing us to travel with almost zero baby gear. Everything was in perfect condition, delivery & pick up were timely & convenient. we will DEFINITELY use baby'tems for all future trips... We would love to see this service expanded to other countries as well!! Alessandra from Brazil (Yoyo stroller rental in Paris): "This service was excellent And we loved the rental stroller. Camille arrived in a few minutes after us at the apartament. The stroller was new, clean, easy And complete.Thank you. Alessandra, from niteroi- Brasil"
Thank you Camille for the exceptional service during our visit to Paris! The Babyzen stroller was a breeze to use , and perfect for the subway. When our 1 year old became tired of being in the stroller, we easily folded it up and carried it while he walked! Couldn't be more pleased with the service. Looking forward to our next trip!